Chicago, and an MFA in Visual Arts and Writing from the California Institute of the Arts. Adair is recipient of the 2010 California Community Foundation Visual Arts Fellowship, the Louis Sudler Prize in the Performing and Creative Arts (Chicago, IL), and the I-Park Foundation (USA), Digital Arts Studios (Northern Ireland), and Akademie Schloss Solitude (Germany) residencies. Adair has performed and screened work internationally, and is author of From JBAD: Lessons Learned (Les Figues Press, 2009) based on her time as ‘embedded media’ with US Forces in Afghanistan. Hats-Off is inspired by the expression ‘to wear many hats’. The video responds to how artists today carry many roles and responsibilities in support of their individual practices. 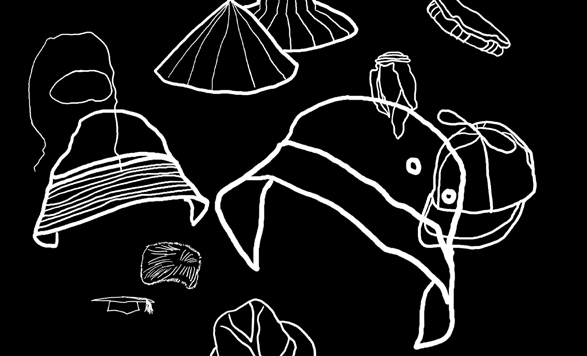 Hats float upwards on screen like the end roll for film credits accompanied by audio which at first is a singular applause and later intensifies into something more directive and urgent. landscape and habitat. 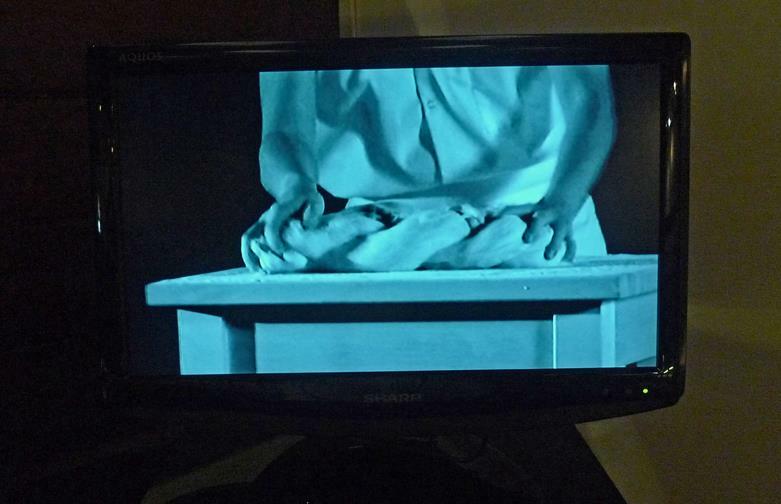 Biernat recently received an MFA in New Media from Transart Institute Berlin/New York. Her works have been exhibited internationally. She is recipient of grants from TMC/Kodak, Lucie Award, Magenta Foundation, and the Photographic Center Northwest Photo-Op. Biernat’s video installation centers on the nature of identity. Taking from previous works that explored notions of home, displacement and the in-between, 6,654 kilometers/ 4,135 miles is about borders and the bridging of distances. This three-channel video installation uses the ritualistic mixing of water from the artist’s place of birth with water from where she currently resides as metaphor for her own hybrid identity. 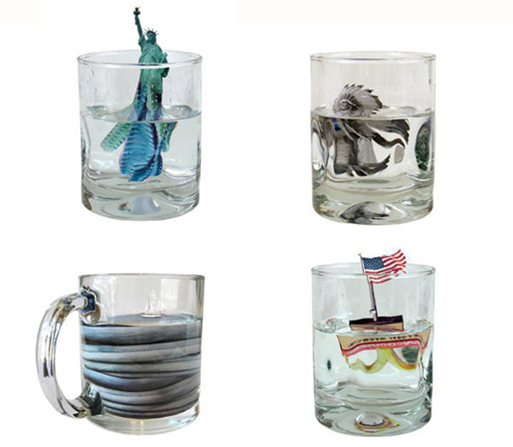 The work is anchored on a mason jar containing the mix of equal parts water from the Atlantic and Baltic Seas. Besides exploring Biernat’s personal situation of being between cultures, the piece examines the transformative qualities of locations and geographies at a time when people are not bound to any one place. The work represents the physical rites of passage when people cross over geographic locations and pays homage to those displaced and who struggle to find their identities in the context of “home”. awarded residencies by the Ragdale Foundation of Chicago and the Horizon Foundation of San Francisco, among others. Her public collaborations are many and include Lineage, a performance with Karen Charman at Evora, Portugal in 2010.
organizer based in the Philippines. He has exhibited widely in the Philippines and abroad. He actively promotes collaborative art processes, and is largely involved in formal and informal education efforts. 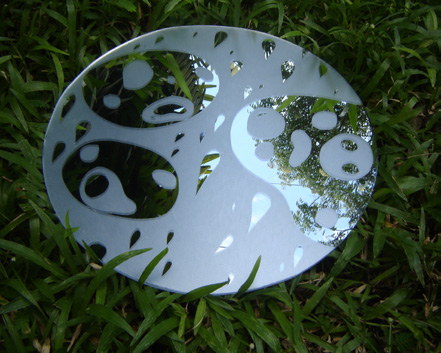 He has organized exhibitions, facilitated workshops, talks and consultations with artists. He graduated from the Philippine Women’s University and is Assistant Professor of Art at the Asia Pacific College Manila. A product of collaboration with interns from the Asia Pacific College, In Transit relives Soler Cuizon’s desire to redefine his space, comfort zones that mark self and home within perpetual states of transit. Items from his numerous travels, as well as his luggage, coat and hat are shown prominently in the piece, echoing his musings on physical crossings as well other forms of displacement. These objects may very well be anchors amidst the constant state of change the artist finds himself in. PHYLLIS EVANS, DAVID FREEMAN and LEILA HERNANDEZ mirror each other’s concerns regarding time, identity and place through cultural cross-over between South Texas and New Mexico. The discourse informing their practice as artists derive from the daily lives and political concerns of the border area, transformed into observations of social situations and concerns about violence arising from the transport and commerce in drugs and undocumented people. The objects chosen by these artists, mostly common, trendy and mass-produced religious artefacts, reflect the social milieu and religiosity of people residing in deep South Texas and Northern Mexico. international relations. Her work critiques US policy and reminds that historically and universally, walls have repeatedly failed in their purpose and only served to create divisions without solving problems. 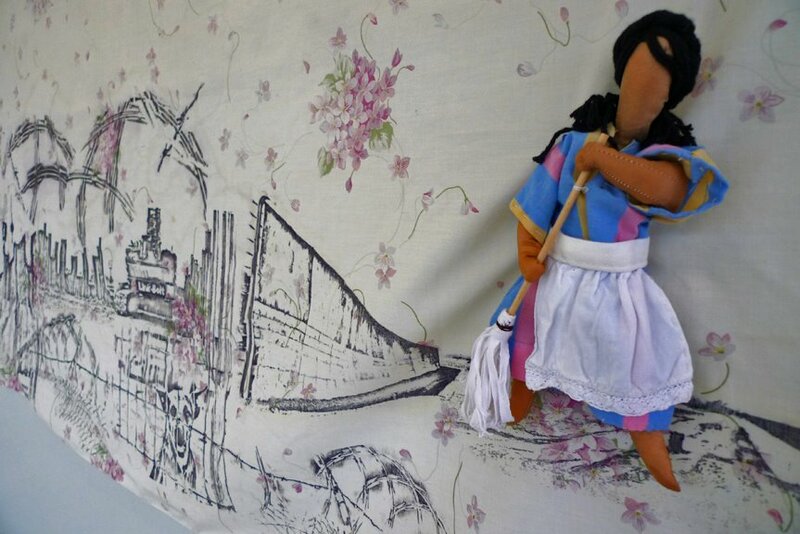 force crossing the border to work as maids, gardeners, and pickers. plague the border – drug runners, illegal immigrants and coyotes, to name a few. These pieces are accompanied by audio narrative based on stories of people of Hispanic backgrounds speaking of their origins, personal history, identity and place. HANNAH ISRAEL, an artist, curator, professor of art, and gallery director, lives and work in Columbus, GA. She received her Master of Fine Arts in Sculpture from the University of Illinois Urbana-Champaign and her Bachelors Degree in Art History at Indiana University of Pennsylvania. She has taught at the University of Illinois Urbana-Champaign, Cornell University, Ithaca, NY, and is currently a gallery director and professor at Columbus State University, GA. She has curated numerous group exhibitions, exhibited her own work nationally and worked on collaborative projects with other artists. Hannah Israel received The Elizabeth Art Foundation Studio Arts Grant, The Daedalus Art Foundation Grant, and The Creative and Performing Arts Fellowship..
Our paths as humans are drawn by margins both real and imagined. We create our own love affair with distance to acknowledge that we exist and need to exist in order to survive. In many cases, travel and migration become acts of necessity. We move to places because we need to survive. For migrants in the US, we see ourselves being in both the Philippines and America. We need to inhabit both to understand our own being. revolve around identity, ephemerality and displacement. reflection of skies and foliage. This layered mediation of reflections alludes to the artist’s desire to locate places where afflictions birthed by longings, unresolved desires and transitory reconciliations are momentarily stalled. In the work, poetry accompanies the maps to create a relationship between them and the drawings. I selected works that relate to longing and wanting and through words I found symbolic gestures of nostalgia and beauty. KAREN MARSHALL is a documentary photographer and educator whose works explore filial relations and relational practice in the arts. filial ties. 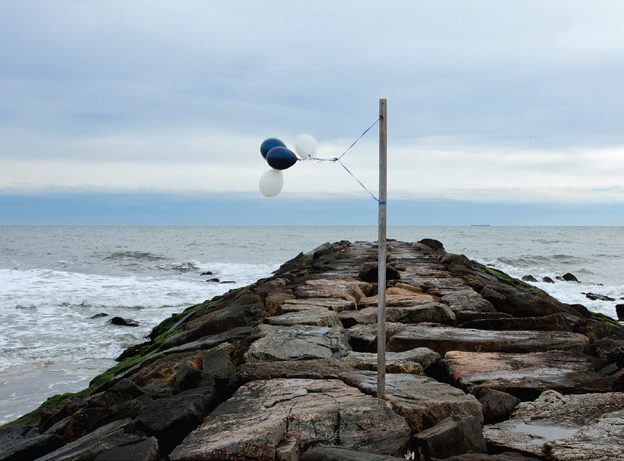 Like the weather balloons sent to the skies by the artist’s father, Karen Marshall in this loving reconstruction floats these questions to viewers of her art and as such magnifies the need for query and reflection. 2007, to lead the reinvention of DCA into a grassroots arts development organization. He has a BA in Humanities (Philippine Literature, Theatre Arts) from the University of the Philippines, Baguio. 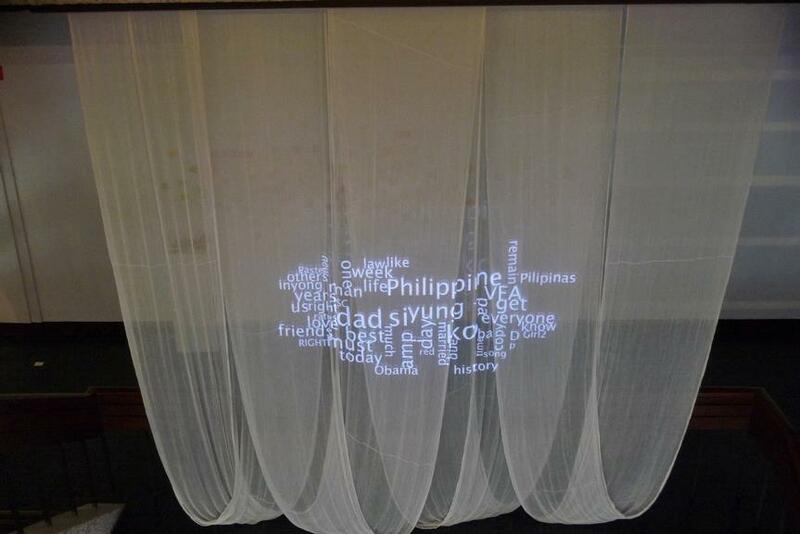 In this virtual collaboration, Ramilo gathers and ‘voxifies’ Facebook feeds from Filipinos all over the world. 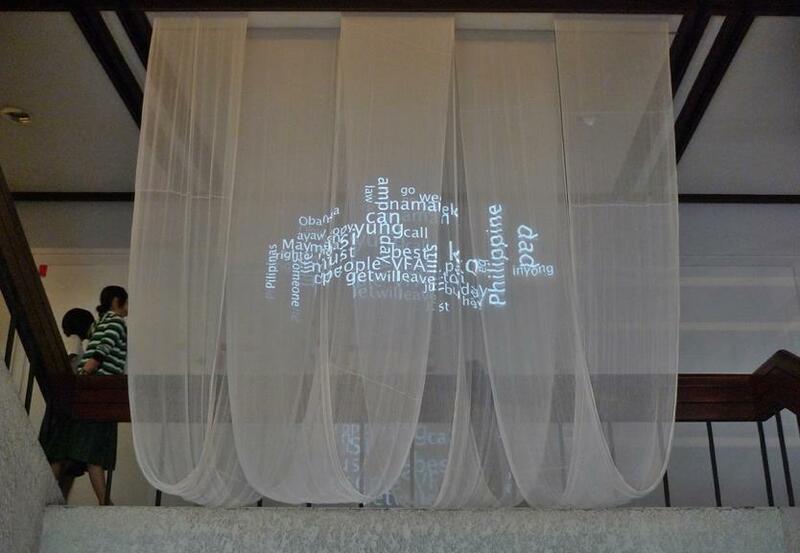 Text will be transformed into sound using the Festival text-to-speech installation. 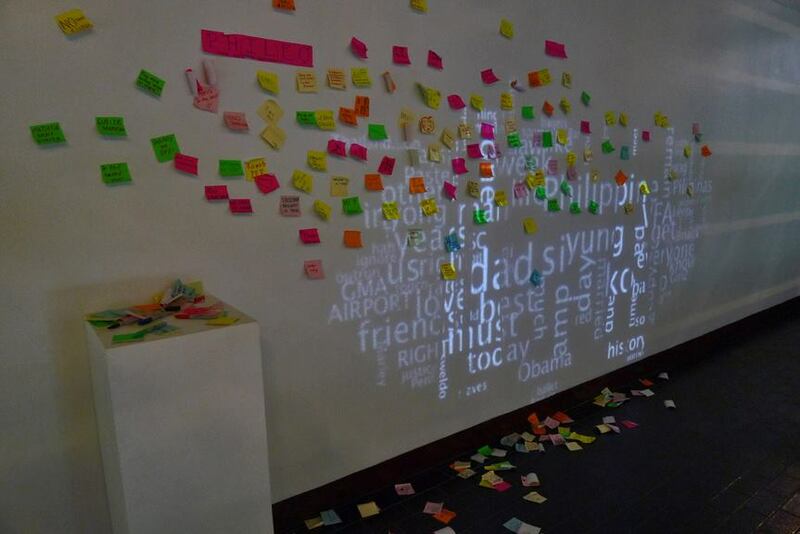 Dispersed throughout the museum, the sound permeates the space and reconstructs the numerous locations of Filipinos across the globe, woven through strands of hyper-real texts and sounds. CHRISTINA QUISUMBING RAMILO received her Bachelor’s degree in Fine Arts, majoring in Editorial Design and Illustration from the University of the Philippines and her Master’s degree in Studio Art and Art Education from New York University. She was based in New York for 23 years but now lives in Quezon City. Threading the Waves/Hibla ng Daluyong is a self-portrait of the artist in trance. In collaboration with Guido Maria and Gari Buenavista, the artist made a series of slow-moving images, “drawings of “ambiguous-scapes” using her own hair. Trance, of not inhabiting the material world may be the state of being the artist refers to. 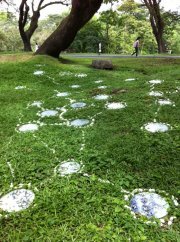 The piece refers to Ling Ramilo’s act of cleansing, shaving her head forty days after her mother’s death and marking a moment of transition and change. 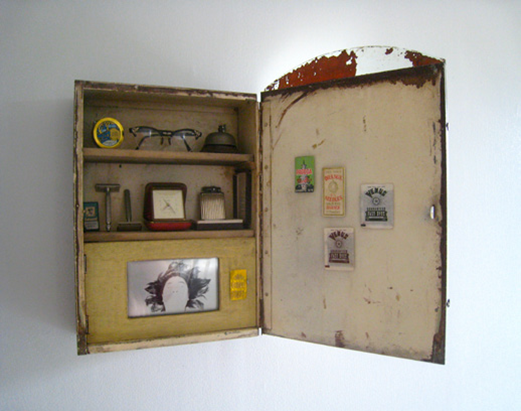 In the work, the objects enconsed in the cabinet are things that the artist kept after her parents passed away; objects like her mother’s teacher’s bell, her father’s old musical lighter, her adoptive mother’s traveling alarm clock and a pair of her grandmother’s eyeglasses, things left behind, which carry with them stories and memories. 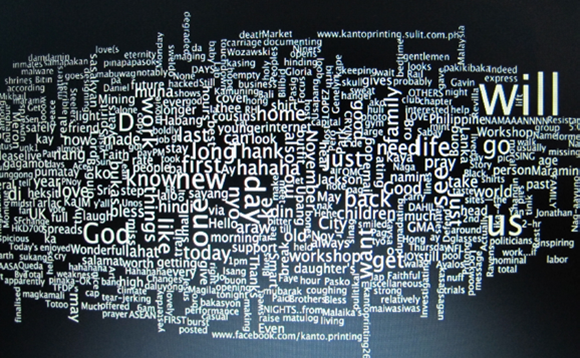 in residencies in the Philippines, Denmark, Germany and the Czech Republic. She has been awarded grants by the Danish Arts Council, the Black town Arts Council of New South Wales, the Australia Council Awards for Young and Emerging Artists, among others. Her solo exhibitions were in art spaces in Melbourne, Manila, Berlin and Copenhagen. Haunt Me, Recite It Again combines the documentary and fiction genres of film. 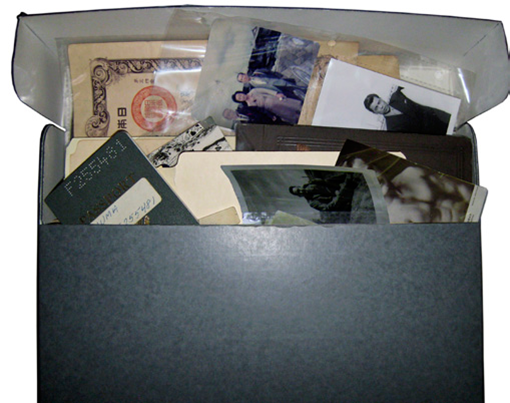 It chronicles conversations between the artist and her grandmother. 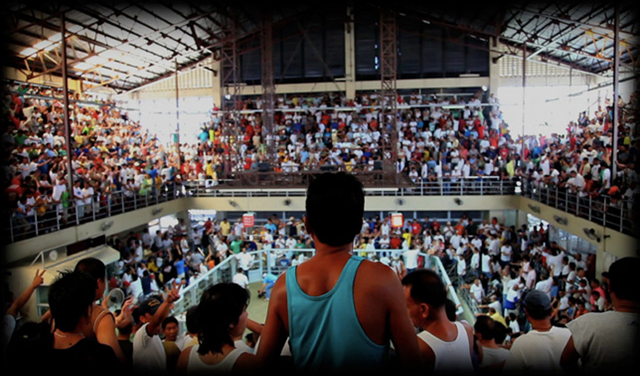 The film protagonist’s recollections of life in the Philippines are mapped against social realities and its latent tensions. Emotions that imbue her stories are graphed within society’s overarching forces. The film uses silence and blurred scenes to locate cultural memory between the gaps of recorded history. 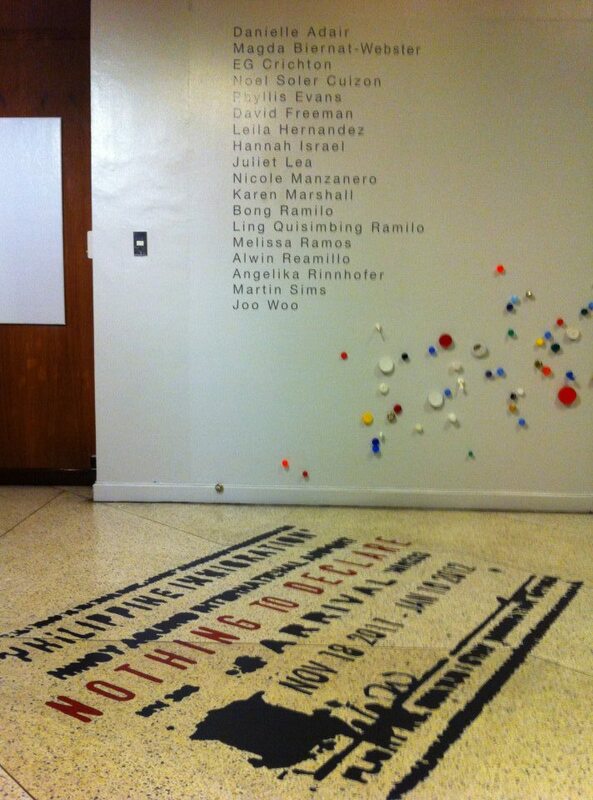 Career Fellowship and the 1994 Thirteen Artist Award from the Cultural Center of the Philippines. He currently divides his time between Fremantle and Manila. 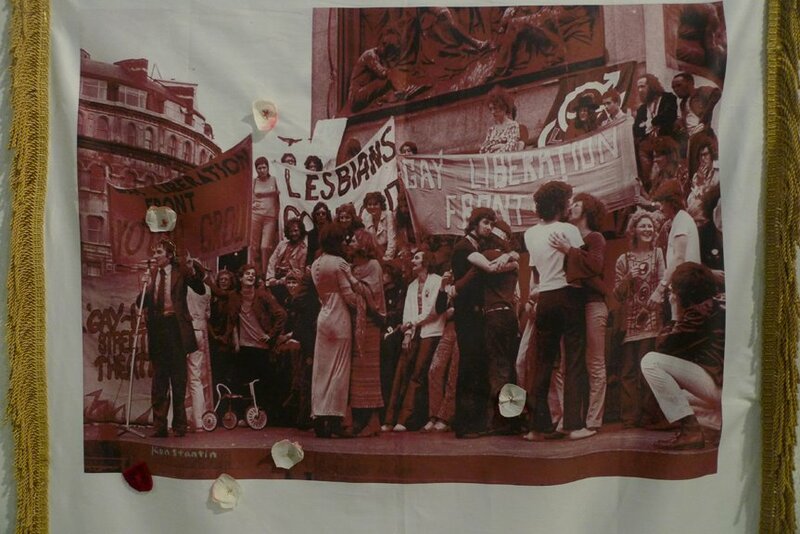 JULIET LEA works with installation, sculpture, mixed media painting and performance. She has a BFA in Sculpture at Curtin University, Perth and an MFA from the University of Tasmania. 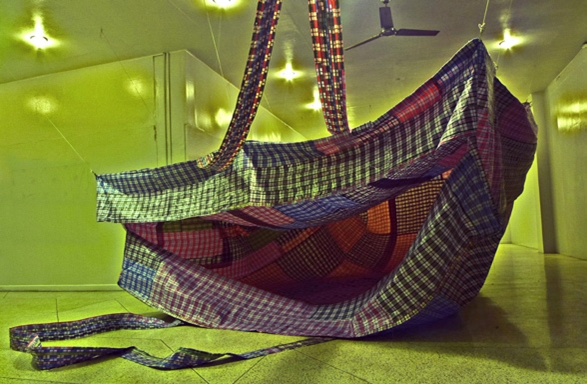 Her works have been exhibited in contemporary art spaces across Australia and Asia. Lea was recipient of various residency grants and the Arts WA MidCareer Fellowship in 2007. She lives and works in Fremantle, Western Australia. The life/art partnership Reamillo + Juliet began in 1993 resulting to collaborations for large–scale installation projects. Between1992 and 1999, these included international exhibitions TransCulture/ Biennale di Venezia (1995), Visions of Happiness (Tokyo), Sexta Bienal de la Habana (1997), Edge of Awareness (Geneva), and Traditions/ Tensions: Contemporary Art from Asia (New York). 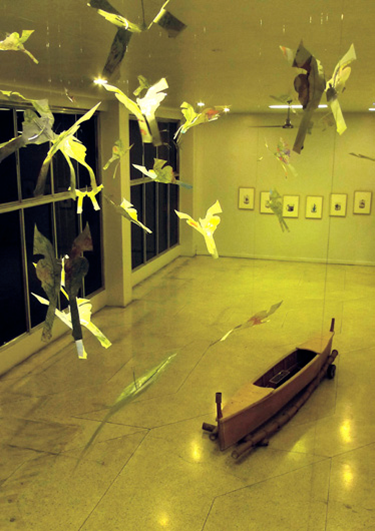 In 2010, Juliet and Alwin presented the collaborative exhibition ‘Cloud + Wings’ at the Manila Contemporary. 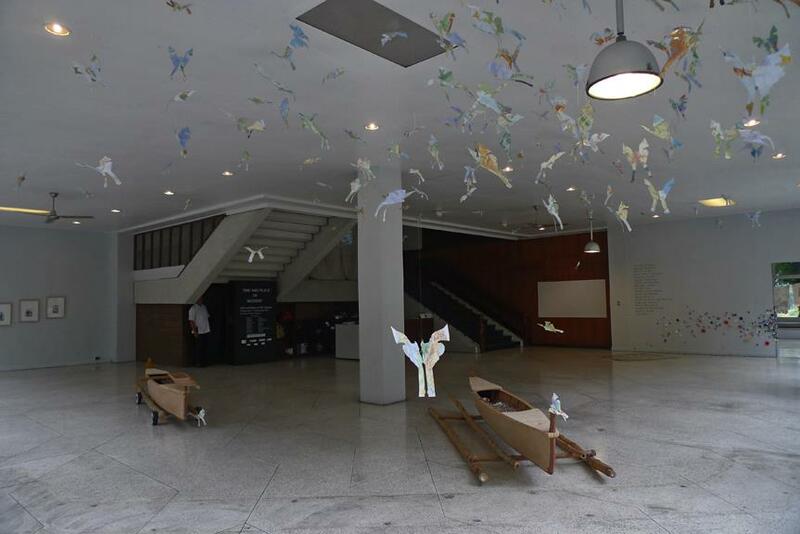 Juliet Lea’s butterflies hang suspended across the museum lobby. kill and maim. The devastation referenced is largely that of nature. But it is a swarm of guns. Where humans take nature to use and destroy. Reamillo wittily combines the stipulations for citizenship for both the Commonwealth of Australia and the Philippines in reference to movements across two countries he calls home. He reconstructs this perpetual crossing across seas by installing two wooden boats seemingly capsized against the white expanse of the museum floors and ceiling. the Dutchess County Arts Council Individual Fellowship in 2005 and was chosen resident artist at Light Work Syracuse, New York in the same year. She held solo exhibitions at Light Work and the Paul Kopeikin Gallery in 2007, the New Britain Museum of Art in 2008, and group shows at the Museum Industriekultur Nuremberg, the Queens Museum of Art, New York and the Michele Mosko Fine Art Gallery in Denver. The piece reflects on the dumping of hazardous materials, the most common route would be from the so-called developed world to third world countries. It questions the business of international customs. The installation proposes a playful alternative and practical function. In the museum, the collected lids dangle on nail heads suggesting artificial islands of waste on the surface of ocean waters. They recall the bodies of water and marine life imperilled by this haphazard practice. they are art medium and because shipped from overseas, may be subject to payment of duties as imported goods. has an extensive background in sculpture and installation practice, which in recent years included sound and video. His works document twenty-five years of exhibition and artist projects, shown in historic sites, civic locations, religious spaces and contemporary galleries. After first exhibiting in London, Sims moved to Sydney, Australia in 1985 where he is currently based. Recipient of numerous awards and international residencies, he is senior lecturer at the College of Fine Arts at the University of New South Wales. He was artist-in-residence at the British School in Rome in 2010, the Cite Internationale des Arts in Paris where the piece was prepared. It was later installed during a residency at the Sirius Art Center. refugees, the very same bag carried by Filipino migrants from countryside to Manila, from city center to far off places of toil. Enlarging a commonplace object transports this luggage from its everyday use into a metaphorical vessel for the perils of uncertain journeys. 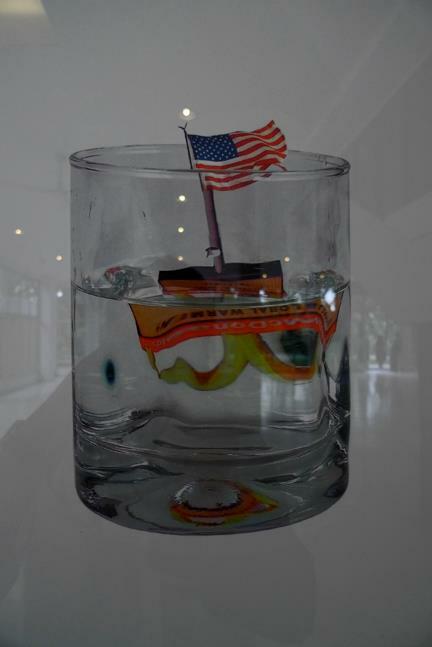 At the installation at the Vargas Museum, the caverns intimated by its flapping handles and its indefinite shape echo the uncertain fates of Filipinos working in far corners of the globe. University in 2007. Her photographs have been included in numerous group exhibitions in both Korea and the US. She has been awarded artist residencies at the Apothiki Art Center in Paros, Greece and at the Red Gate Gallery in Beijing, China. These photographs represent a collection of different places, especially intersections between Korea and the US. Collected pictures of the artist’s everyday surroundings are placed within images of glass cups used every day in order to visually and conceptually absorb different environments and their cultures. Joo Woo’s photographs embody her desire to come to terms with her origins and document this through an artistic archive of her nomadic lifestyle. 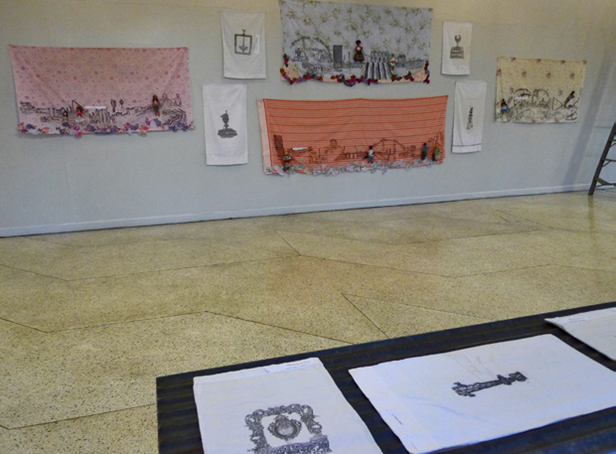 Works in the third leg of the exhibition Nothing to Declare all evoke a journey whose destination is yet to be decided. Manila and the exhibition sites for Nothing to Declare are temporary stations in a route continuously marked as process, and as being in progress. 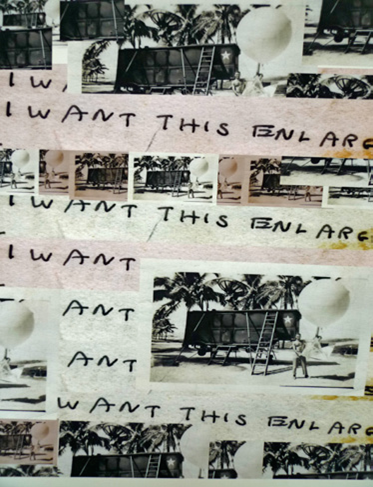 Movements here may very well be a going back and forth across time, discerned in Karen Marshall’s collages of enlarged photos and scanned items from her veteran father stationed in Pangasinan during the Second World War; or in E.G. Crichton’s redefinition of the artist as ‘matchmaker’ in her breathing, and growing wandering archives. Hannah Israel enlivens cartography in her translucent maps and opaque sculptures of framed places, inspired by the museum’s archives. All three artists breathe life to the past and braid them into the strands that make the present. 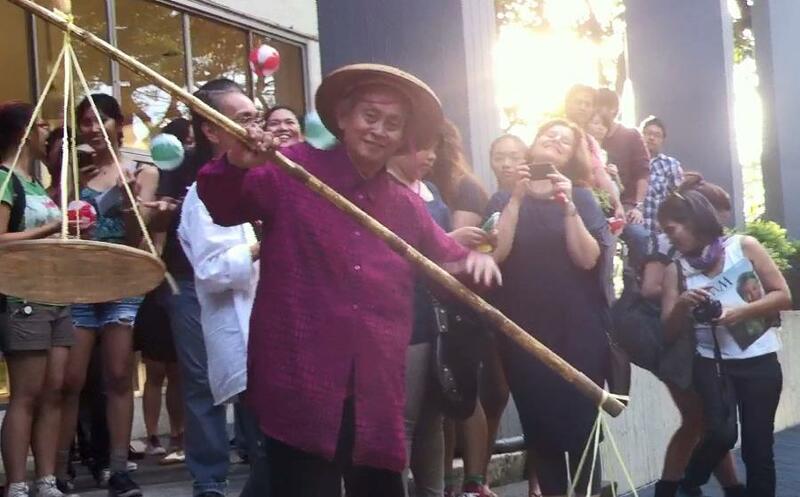 David Cortez Medalla, Artist-in-residence, Ateneo Art Gallery, performed at the opening. 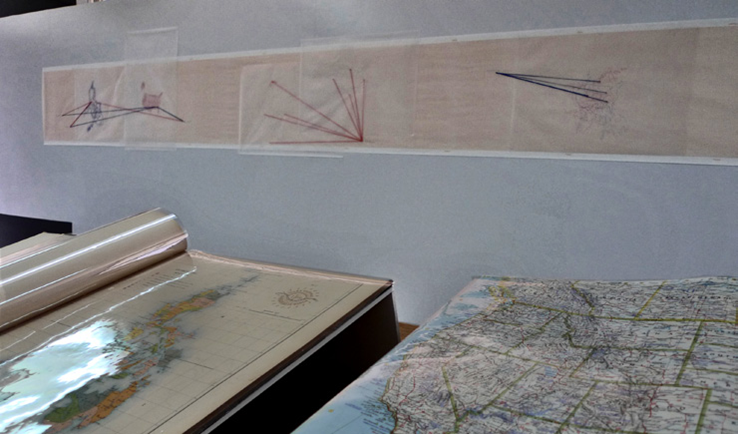 Movements across borders at once porous and defining are recalled in Alwin Reamillo’s and Juliet Lea’s installation of wooden boats and delicate butterfly cut-outs of maps. Identity in constant transit is embraced and distilled in Magda Biernat’s video installation, as well in Joo Yeon Woo’s photographs of locations contained in everyday drinking mugs. Biernat mixes waters from the Atlantic and the Baltic Seas in an attempt to make sense of her hybrid self while Joo Yeon Woo contains icons of places inside the confines of a mundane object. In both, there is the bodily yearning to contain, to ingest even the contradictions inherent in a self that straddles two discrete locations. Christian Ramilo and Melissa Ramos look back through the lens of remembrance. Both severed from their country of birth, they attempt to reconstruct a place by inhabiting a primordial space where the spirit and soul may rest. The former locates this while in a state of trance following her mother’s death and the latter through a filmed recollection of her grandmother’s life in the Philippines. This longing is likewise an apparent strain in Nicole Manzanero’s layered mediations of vision, of objects both seen and refracted. 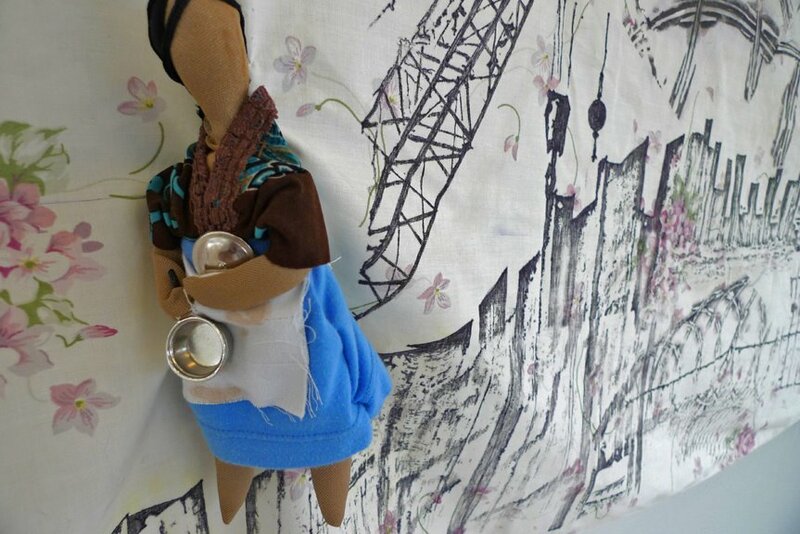 Movements are sometimes necessitated by dire conditions, explored in Phyllis Evans, David Freeman and Leila Hernandez’s dolls from second-hand clothing. 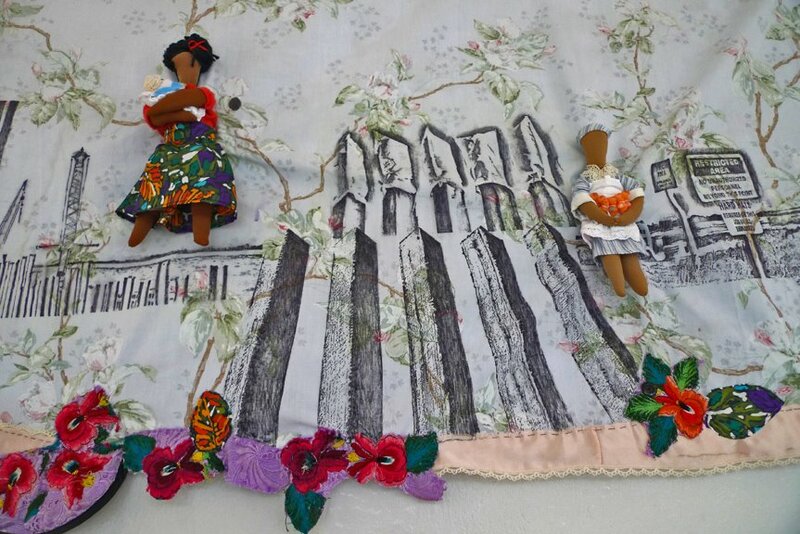 Landscapes of labor are reproduced on flimsy yards of cloth and the dolls which, hover precariously on their grounds signify uncertain situations. Much like the cloth from whence they were fashioned, the migrant workers who cross the border in Mexico to find temporary work as maids, gardeners, pickers and harvesters in orchards and farms are regarded as second-class citizens with uncertain futures. The hazard intimidated in this risk-taking finds resonance in Angelika Rinnhofer’s reconstructions of islands of waste that pollute oceans and seas. 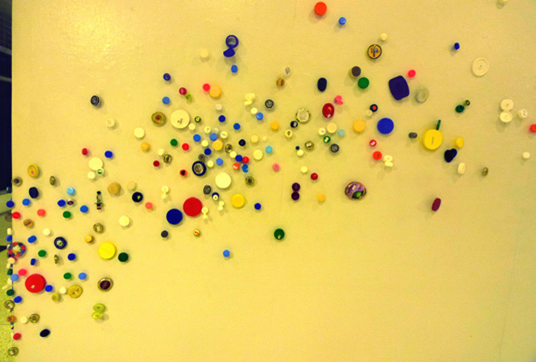 Through wavering clouds of plastics bottle lids, she questions the dubious transfer of hazardous materials from developed nations to third world countries. Nothing speaks clearly of leave-taking than Martin Sims’ installation of a plastic luggage often seen in Manila on local travels. 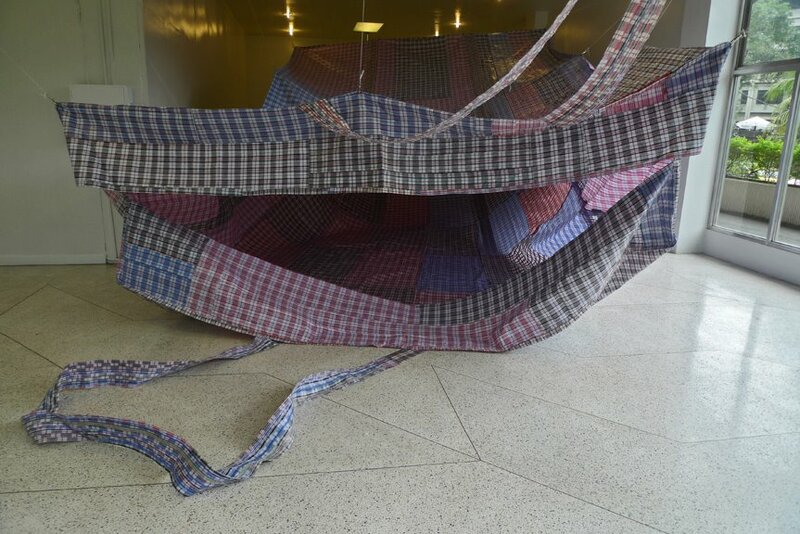 The artist astutely points to this as the 21st century refugee’s humble luggage as it recalls the makeshift refugee camps and tents for those displaced by conflict or calamity or the living conditions of bare survival of illegal settlers and the homeless across the world. Indeed, the bag’s cavernous mouth and lumbering from calls to mind the perils of crossing borders, as bodies may be ferried back lifeless and maimed. Manila may very well be the best transit point for a project that explores absences and gap, displacement and slippages, the random outcomes of processes founded on unpredictability, multiplicity and the possibilities inherent in fracture. These sensations are embodied by this fragmented city replete with contradiction and its unusual charms. Yet as the global landscape attests, perhaps other cities house pockets versions of Manila. In these places fraught with struggle, transgressions are increasingly transient and itinerant existence the language of those marked by silence, those with ‘nothing to declare’. 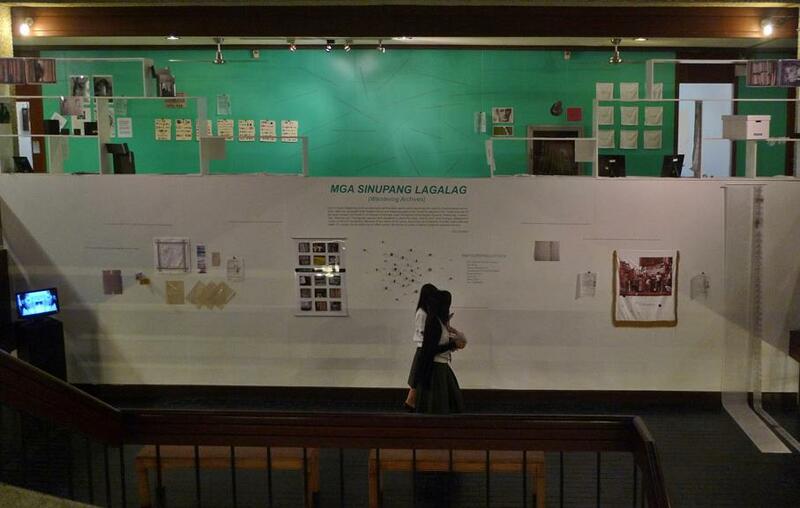 Christian Ramillo breaks the silence in a piece that maps the nomads Filipinos have become in a global context. The artist takes on many hats that of mediator and someone who identifies new itineraries, as Adair’s piece illustrates. While physical presences are amiss, their voices (as much theirs as ours) are transformed through sound permeating space which we claim, albeit momentarily.